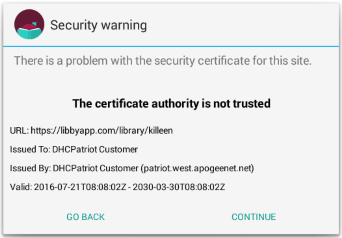 If you're browsing a library's digital collection and you get a security warning like one of the ones below, please be aware that your device is not making a direct connection to the authentic OverDrive service. Instead, a third party is intercepting your connection to OverDrive. Open a web browser on your device and go to http://www.overdrive.com (make sure you're using http, not https). You should see a sign-in prompt from the Wi-Fi provider. Sign in if you'd like to use their service. 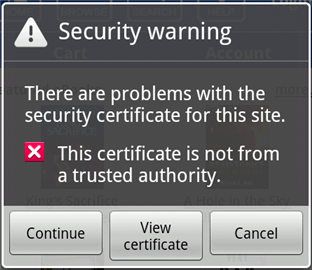 Close and then reopen the app or website where you initially saw the warning. After following these steps, you should no longer see the security warning in your digital library. If you still see the warning, or if you couldn't complete these steps because you didn't see a sign-in prompt, we recommend that you contact the provider of your internet connection to determine whether this is an official part of using their service. 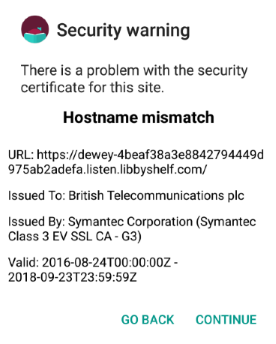 If you continue despite the warning, the third party will have access to the information you send and receive, possibly including passwords, reading activity, and other private or personally identifiable information.